The first entry of 2012 is all about physics, art and 'finding patterns'. I’ve been asking around the department trying to identify the various forms in the relief sculpture above the physics building entrance made by sculptor and RCA professor, John Skeaping circa 1958. The intiguing motif pictured above remained stubbornly unidentified until the week before Christmas when I had the good fortune to arrive in Chris Philips' office and learn that it is probably the pattern made on the surface of a crystal by an irregularity called a screw dislocation. Screw dislocations occur in crystal structures as they grow or when they are placed under stress. Part of one plane of molecules or atoms is shifted relative to its neighbour. In the diagram below, you can imagine how travelling in a circular path around the dislocation line from the far left surface would take you on a helical path through the material from A to B. 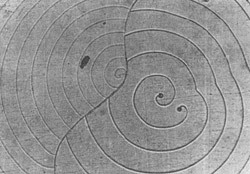 The tell tale sign on the surface of a crystal is a spiral, like those in our sculpture or in these images of silicon carbide. Once a dislocation has developed the crystal growth continues the pattern. Screw dislocations are important to understand particularly in the production of semi conductor lasers, so that we can learn how to avoid them.Chris says " If a crystal is perfect, when you excite it with an electrical current, the electrons and holes you are injecting recombine to give you the laser light you want. Dislocations, however, introduce “non-radiative” recombination; carriers recombine there in a way that generates heat and no light. Worse, the heat drives chemical degradation processes, (so-called “dark line defects if you want to get technical) which, over time, lead to device failure. This is a big problem if, e.g. the laser device is buried deep under the Atlantic at the time. So, we don’t like screw dislocations!" We tentatively think we also solved another enigma in the Blackett building sculpture.....Chris says, the crystalline structure shown here in the original design suggests one of the technologically important semiconductors used to make lasers, the internet and computer chips – Gallium Arsenide (shown in 1, 1, 1 plane). Compared with silicon, GaAs is a very efficient emitter of light (due to its direct band gap structure) and has the advantage of being relatively insensitive to heat. It is massively used in fibre optics communications networks – a vital component to the working of the internet and our modern world. A demonstration model is shown below. Thanks to Chris for solving the mysteries and for casting his eye over these notes. Chris Philips is in the Experimental Solid State Group at Imperial College.